LSD Stokes I (bottom), Stokes V (middle), and diagnostic null (N) spectra (top) obtained for HD 101065 on four nights between 2015 and 2017. The LSD spectra were calculated using eight different line lists, indicated in each panel. For each panel, spectra for 2015 June 5, 2016 June 16, 2017 June 4, and 2017 June 7 are shown from bottom to top; the last three are shifted upwards for better visibility. The LSD Stokes I, Stokes V, and diagnostic null (N) spectra at the top show all four spectra overplotted. Credit: Hubrig et al., 2018. European astronomers have conducted a study of Przybylski's star and found that it takes almost 200 years to fully rotate on its own axis. The finding, which could have implications for the understanding of chemically peculiar stars, is reported April 19 in a paper published on the arXiv pre-print repository. Located some 370 light years away from the Earth, Przybylski's star (also known as HD 101065) is a rapidly oscillating Ap star (a type of chemically peculiar star) in the constellation of Centaurus. The star has been the subject of numerous observations, as it fascinates astronomers mainly due to its exotic chemical composition. However, although many of basic properties of Przybylski's star have been uncovered by previous studies, its rotation period remains a mystery. What is known is that in general, Ap stars could have rotation periods ranging from a half-day to even 300 years. Now, a team of astronomers led by Swetlana Hubrig of the Leibniz Institute for Astrophysics Potsdam in Germany, presents a new research regarding Przybylski's star, which focuses on magnetic and pulsational variability of this object. The study, based on observations performed between June 2015 and June 2017 with the use of the High Accuracy Radial velocity Planet Searcher polarimeter (HARPSpol) at ESO's 3.6 m telescope in Chile, has also found that the star, besides its chemical peculiarity, is also unusual when it comes to its rotation. 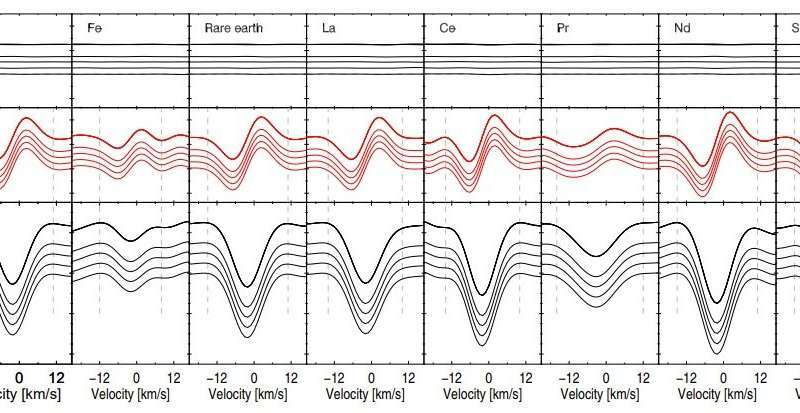 "Our analysis of newly acquired and historic longitudinal magnetic field measurements indicates that Przybylski's star is also unusual with respect to its extremely slow rotation," the researchers wrote in the paper. Hubrig's team found that the probable length of the rotation period of Przybylski's star is about 188 years. This calculation was made by analyzing all available longitudinal magnetic field measurements and adopting a dipolar structure of the magnetic field of the star. However, the researchers underlined that the estimates made by them are tentative and need further studies to confirm them. Therefore, they added that their findings regarding the rotation period should not be considered as a unique solution at the moment. "Our estimation of a 188 yr period should thus not be considered as a unique solution, given the time coverage of the longitudinal magnetic field measurements of 43 yr, which represents a lower limit on the true rotation period of HD 101065," the paper reads. According to astronomers, the discovery of a very long rotation period of Przybylski's star along with the previous detection of slow rotation in six other magnetic Ap stars suggests the possible existence of other not yet identified slowly rotating Ap stars. They concluded that further observations of such stars could be very important in improving our knowledge about their formation and processes behind their slow rotation. These processes are not yet identified by astronomers. It is generally assumed that Ap stars are slow rotators because of magnetic braking and that most of the angular momentum is lost in the pre-main-sequence phase. Since its discovery more than half a century ago Przybylski's star (HD101065) continues to excite the astronomical community by the unusual nature of its spectrum, exhibiting exotic element abundances. This star was also the first magnetic chemically peculiar A-type star for which the presence of rapid oscillations was established. Our analysis of newly acquired and historic longitudinal magnetic field measurements indicates that Przybylski's star is also unusual with respect to its extremely slow rotation. Adopting a dipolar structure for the magnetic field and using a sine wave fit to all reported longitudinal magnetic field values over the last 43yr, we find a probable rotation period P_rot ~ 188yr, which however has to be considered tentative as it does not represent a unique solution and has to be verified by future observations. Additionally, based on our own spectropolarimetric material obtained with HARPSpol, we discuss the impact of the anomalous structure of its atmosphere, in particular of the non-uniform horizontal and vertical distributions of chemical elements on the magnetic field measurements and the pulsational variability. Anomalies related to the vertical abundance stratification of Pr and Nd are for the first time used to establish the presence of a radial magnetic field gradient.